What car checks should I carry out before a summer drive? Check all tyres (including the spare) are free from damage, tyre pressure is at the recommended level and treads are at least above the minimum legal depth. 2. How to check your engine won’t overheat? Check the engine cooling system to avoid overheating. Ensure that your coolant level is topped up and check coolant hoses before setting off on a long journey. For more information, please contact your nearest Toyota authorised dealer. Check your oil levels periodically. If it's time or nearly time to have your oil changed, do it before you leave on your road trip. If you’re thinking ‘what oil’s right for my car?’ then, contact your Toyota authorised dealer. 4. How to check your air conditioning works? Check your car’s air conditioning system before you travel. Hold your hand near the air vents and feel the air coming out. If it’s an uninterrupted flow of cold air at the same temperature, then your air conditioning is likely in good working order. 5. How to pack your car for a road trip? Ensure heavy items are stowed on the boot floor behind the rear seats. If you need more space, use a roof rack and easy to install luggage box for added storage. If you’re towing a trailer or boat, ask a professional to install a Toyota genuine tow hitch. Finally, if you’re bringing pets along, ensure your Toyota dog guard is installed correctly. Discover the range of Toyota summer accessories for your car. Other useful tips for your better journey. 6. How to improve visibility when driving in summer? Ensure your windscreen screen wash reservoir is topped-up, and use a high-quality glass cleaner to keep your windscreen clean and smear-free. If smearing continues, check that your wipers are free of damage, and fit new blades if necessary. Carry sunglasses with a graduated tint or polarised lenses, to reduce glare and improve clarity. Always take a 15-minute break every two hours on your long journey. For maximum alertness, stop for a snack, stretch your legs and always drink plenty of water to stay hydrated. Keep entertained with a driving playlist or catch up on your favourite shows with a Bluetooth® radio. 8. How to keep your car cool on summer days? Try and find shade to park under a tree or by a buildings to avoid an uncomfortable return trip. Opening windows or running your air conditioning for a few minutes before setting off, will cool things down, too. For ultimate protection, attach a thermal windshield cover to reduce the effects of strong sunlight. 9. How to keep children entertained on long drives? Get them excited about the journey, show them your route on the GPS navigation system and take a multimedia device for movies, music and games on the move (don’t forget batteries and headphones). 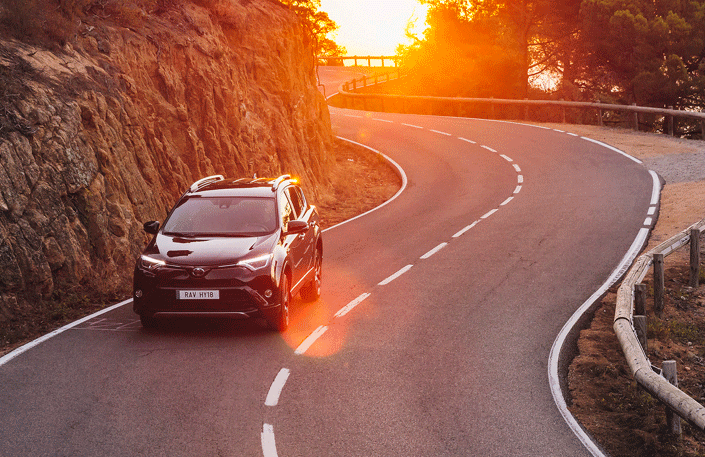 Toyota Summer Offer Whether you’re heading to the beach or exploring new sights, the Toyota Summer Health Check and range of accessories ensure you’re geared up for safe and carefree summer adventures. Caring For You and Your Toyota Series A range of Caring For You and Your Toyota driver’s cards with the aim of providing simple-to-follow instructions, for a multitude of motoring conundrums. Child Car Seats A child’s body is delicate and, at this ever-growing stage, too small and fragile for standard car seatbelts. A correctly installed child seat can be a life saving measure, evenly distributing the force felt in a collision. Toyota Isofix Duo Plus Child Seat Toyota offers a wide range of child car seats for all ages that incorporate the very best fixings and robust fabrics. Parking Aids Technology that gives you more confidence when parking Parking Aids Technology that gives you more confidence when parking Brake pads and brake discs The braking system is the most important safety feature within your Toyota. The ability to stop and slow especially in poor driving conditions or emergencies depends entirely on the performance of your brakes. Toyota Service Promise The Toyota Service Promise is to keep your Toyota a Toyota. Discover the ways we are committed to taking the best care of you and your Toyota.